And hand-made artist’s book in a limited edition of 30 signed copies, Timeless Flow: A Willamette Calendar is the second collaboration of three Northwest artists: Oregon Poet Laureate Emeritas, Paulann Petersen; printmaker, Barbara Mason; and book artist, Laurie Weiss. The poems collected in book follow the changes of the seasons along the Willamette River in Oregon and are presented against the graphics of water movement through a palette of seasonal changes. The floating nature of the panels in this Hedi Kyle structure contribute to the feeling of movement of the water and its dynamic nature. The etchings are hand printed on Somerset silk paper using solar plates. The text is in Garamond printed on translucent vellum paper. 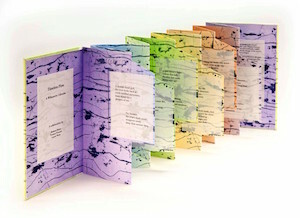 The book is designed using Hedi Kyle’s Pivoting Panel structure.